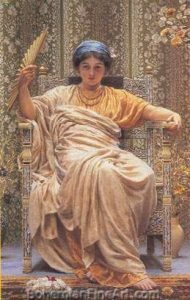 Below is the detailed biography of Albert Joseph Moore, a British painter especially known for his depictions of women in the everyday life form. He refrained showing women in luxurious clothing and lifestyles as he believed in the beauty of simplicity. 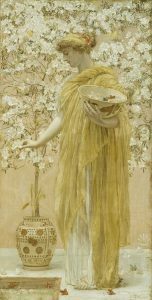 Albert Joseph Moore was born on the 4th of September, 1841 to William Moore and Sarah Collingham. Both William and Sarah had numerous children with other people. Albert was William’s thirteenth son, and fourteenth of Sarah. 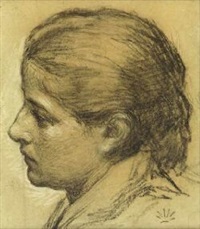 Most of his many brothers and sisters were artists, which is where he drew the inspiration. One of his brothers was Henry Moore – an English landscape and marine painter. 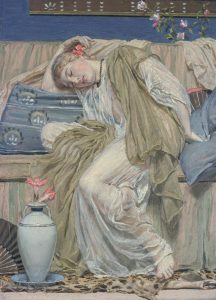 Albert Moore was home educated in arts by his father William but went to the Archbishop’s Holgate School to complete his academics. He later joined the St Peter’s School in York. His work in art was highly appreciated and was also rewarded with a gold medal from the Department of Arts and Sciences at Kensington. He later was taken care of by his brother, John Collingham Moore. He was also an art student at the Royal Academy that he joined in 1855. 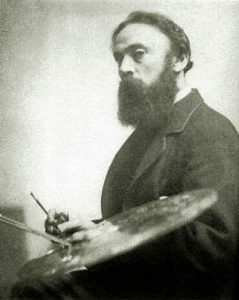 He exhibited his first painting at the Royal Academy in 1857. 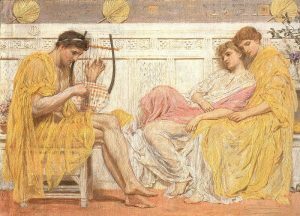 Albert Moore started his career by painting religious subjects. ‘The Mother of Sisera looked out of a Window’ and ‘Elijah running to Jezreel before Ahab’s Chariot’ were two major paintings that he began with. During this time he was under the training of the French architect William Eden Nesfield in France. His paintings showed a decorative element and the women in his paintings were often highlighted. During the 1860’s he was designing tiles and glass designs for the Morris’ and Faulkner and Co. Therefore, he slowly resorted to painting women portraits and landscapes that include the dominance of the feminine element. He emphasized on floral decors and accessories, draping cloth on women, colors that were light yet elegant. This gave rise to a new movement in Victorian art – the Aesthetic Movement. He was also known for his wall paintings and the ceiling paintings in the houses of various Dukes and Duchess of the United Kingdom. His famous painting ‘ Elijah’s sacrifice’ came out in the year 1863. His paintings had charm, delicacy and a mellow tone. He refrained from showing luxury but a different class of women in the European society that dressed in a non – fancy fashion. His paintings displayed fine delicate tissue like garments. Every picture took months to come out. The accuracy, the use of light and display of atmosphere was well shown with fine brush strokes and high detailing. Albert Moore lost his father in 1851. His father was his first ever trainer in art. His death depressed him but he was taken care of and further raised by his brother John Collingham Moore. John not only taught him art but also raised him which is why they were extremely close. It is unknown whether Albert was married or had any children. Albert died when he was only 52 years of age, he caught a certain illness that was apparently incurable at the time. However, it is believed that Albert worked until his last breath. His final painting was completed in the same year of his death. He died on the 25th of September 1893 in Westminster, London. He is buried at the Highgate cemetery. After his death, an exhibition was held at the public collections museums of Birmingham, Manchester and many other cities in 1894. His works hang in museums all across Britain especially in the British Museum and in the Victoria and Albert Museum in London.